At Ferroli we take training very seriously – no matter how well-built the boiler, it can only sustain optimum performance if it’s been correctly installed and maintained. That’s why we are continually expanding our training centres across the UK so that our installers have the knowledge and confidence needed to fit Ferroli boilers for their customers. Our free 1 day current product awareness training courses are designed to give engineers a comprehensive understanding of installation requirements, appliance set-up and servicing, fault finding and parts replacement. Training is led by Dean Mallows, our peerless expert on all things technical. Dean’s years of experience in a classroom environment means he’s a great communicator who ensures that both experienced and novice installers come away with the genuinely useful skills needed to deliver a better service to their customers that will help them build business. x, Fer and Energy Top models. Our other training locations are at: Sunderland, Bradford, Halifax, Doncaster, Waltham Abbey, Basildon, Southampton, Manchester, and Blackpool. 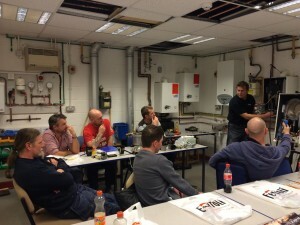 We also offer hands-on service/fault finding courses on our older range of boilers; these can be configured to suit the attendee’s requirements. These courses usually consist of no more than four persons to allow maximum attention to the individual’s training requirements and are fully hands-on. These courses are chargeable and are currently only available at our head office in Burton-upon-Trent. For more information on our training courses and how to book, please contact us on training@ferroli.co.uk 0330 205 0000. All persons attending training must be Gas Safe Registered.